July 16, 2016 By This post may contain affiliate links. 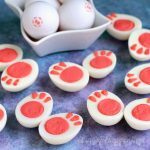 Make gumdrops using a sea life silicone mold. 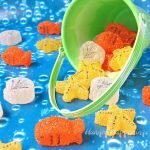 These Homemade Under the Sea Gumdrops are shaped like Goldfish, Starfish, and Sea Shells and are fun treats for your beach themed party. 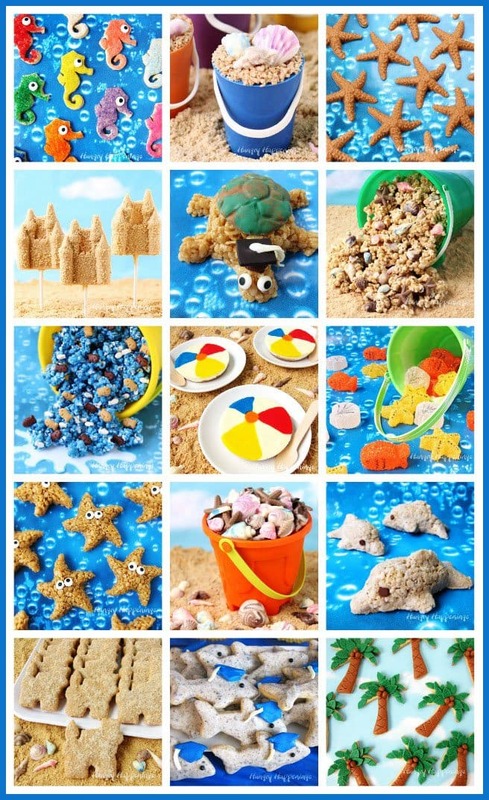 I bet you’ve been wondering why I haven’t shared more tutorials for all the beach themed treats I made for my nephew’s graduation party way back in May. Well, to be honest, I keep getting distracted. Not only have I created new treats and shared those tutorials since that party, but I’ve also been planning a weekend retreat for 5 of my favorite food craft bloggers. 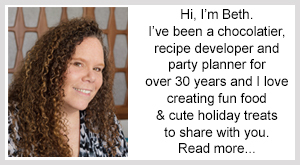 It’s been so exiting making all the arrangements for the bloggers to join me here for a few days filled with chocolate making, socializing, learning, and fun that I have really fallen flat when it comes to getting my beach themed recipes posted. 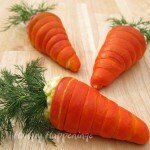 Summer will be over before I know it and you’ll all be ready to see back-to-school and Halloween treats and I’ll still be showing you how to make edible sea animals. So, I better get a move on it. Today, I’ll show you how to make these cute Homemade Under the Sea Gumdrops. I’ve shared my recipe for homemade gumdrops a few times before. It’s made using fruit pectin not gelatin and it makes the best gumdrops you’ll ever taste. They are soft and chewy candies that you can flavor with any candy oil you like. They are all so much better than any gumdrops you can buy in the store. Oh, and they are cuter too! 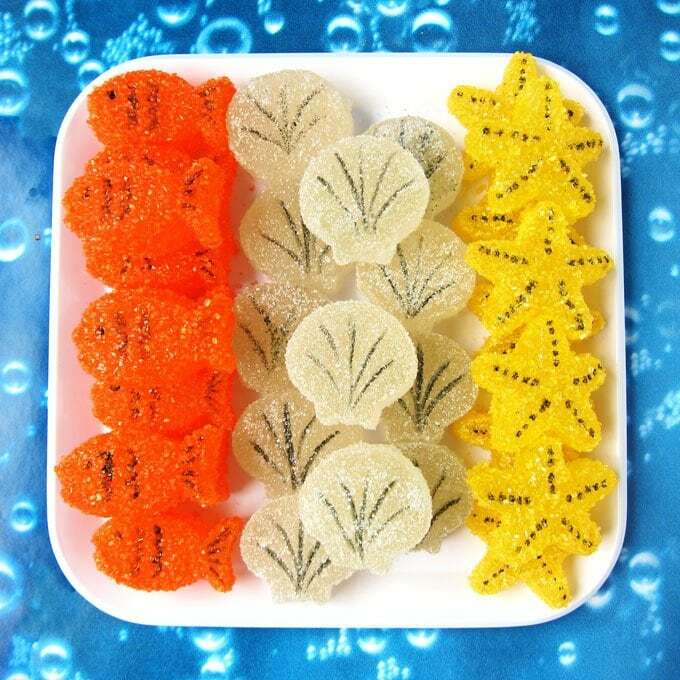 These orange, yellow, and white gumdrops shaped like goldfish, starfish, and sea shells are the perfect summer treat! 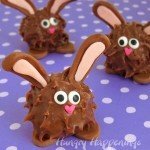 They are adorable and yummy, and they are homemade so you don't have all the preservatives of store bought ones! Butter the sides of a heavy 1-1/2 or 2 quart saucepan and set aside. In another 2 or 3 quart saucepan combine the water, pectin, and baking soda. In the buttered saucepan add corn syrup and water. Set over medium-high heat stirring until sugar disolves. When candy reaches 260 degrees Fahrenheit, remove the lid and place the pot of pectin back on high heat and bring to a boil. When candy reaches 280 degrees F, remove from heat and slowly pour in the hot pectin mixture. Return to medium-high heat and stir for one minute. Remove from heat and stir in 1/4 - 1/2 teaspoon flavored oil. Carefully pour into silicone candy mold. Set molds aside for 6 hours. 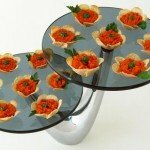 Turn molds upside down and press on the back side of the mold to remove the candies. Add details using a black food coloring marker. Roll in colored decorating sugar. Set aside for 1 hour before packaging. Use this technique to make your homemade gumdrops. Butter the sides of a heavy 1-1/2 or 2 quart saucepan. Set aside. In another 2 or 3 quart saucepan combine water, pectin, and baking soda. Mixture will be foamy. Bring to a boil over high heat, stirring constantly. Remove from heat and set aside. In the buttered saucepan pour the corn syrup into the bottom. Sprinkle sugar in the center of the pan. Turn heat on medium-high and allow it to cook for one minute. Then stir gently to dissolve sugar. Be careful not to splash the sugar crystals onto the side of your saucepan. Bring to a boil, stirring constantly. This took me just a few minutes, but the recipe says it can take up to 10 minutes. Clip your candy thermometer onto the side of your pot. Cook until the thermometer registers 260 degrees Fahrenheit. You will continue to cook your sugar (ultimately you’ll want it to reach 280 degrees which is the soft crack stage,) but at this point, you need to set your pan of pectin mixture back on the stove and heat it over high heat until it comes to a boil. Once your pot of boiling corn syrup/sugar reaches 280 degrees remove it from the heat or turn off your gas. Slowly and VERY CAREFULLY drizzle in the hot pectin, stirring slowly yet constantly. You DO NOT want to splash any of this hot boiling sugar on your hands. Once all the pectin has been poured into the saucepan, return it to medium-high heat and cook it for one more minute, then remove from heat and pour into a glass bowl, with a spout, preferably. This stops it from continuing to cook. To flavor your gumdrops, add 1/4-1/2 teaspoon flavored oil, if flavoring the whole batch. To check if you like the flavor, fill a glass with ice water, take a small spoonful of your hot gumdrop mixture and set the spoon in the ice water. Let it set for at least 30 seconds. Remove it and touch it to make sure it is cool. The inside will be hotter than the outside, so if it feels warm at all, return it to the ice water for another 30 seconds. Then taste it. Adjust your flavoring accordingly. Optional: You can divided your batch and use various flavorings, if you prefer. You can also add coloring now if you’d like. Grocery store variety food coloring will work fine. Carefully pour into the silicone mold, filling each cavity to the top. If you make a bit of a mess, like I did, you can use a metal spatula to scrape off the excess candy into your pan, just be sure you DO NOT touch the hot candy. Let the candy sit at room temperature for at about 6 hours to firm up. 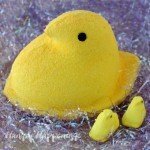 To remove your gumdrops from the silicone molds, turn the mold upside down and press on the back side of the mold. The candy will pop right out. 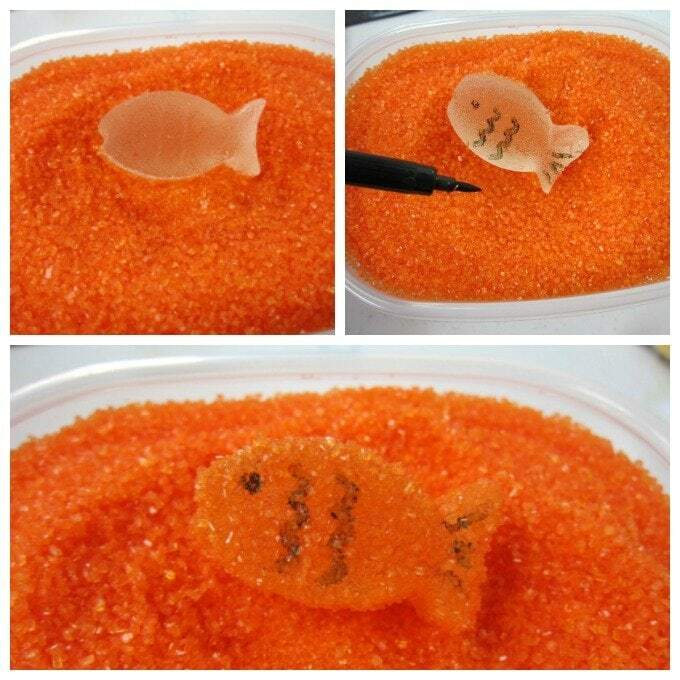 To add some detail to your goldfish gumdrops, use a black food coloring marker to draw on scales and an eye. Then roll the candy in orange decorating sugar. You can add details to the starfish and sea shells too. Then roll the shells in white, opalescent, or silver decorating sugar and the starfish in yellow or brown decorating sugar. Let the gumdrops sit at room temperature for about an hour if you plan to package them or stack them on top of each other in a beach pail or on a plate. To make your display of Homemade Under the Sea Gumdrops really pop. use a roll of Bubble Backdrop Paper. I found it at JoAnn’s in the school section. I used it to display a lot of my beach themed treats. You can find the tutorials for the projects by clicking on the links below. 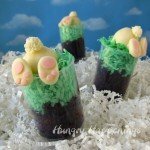 If you recreate these Homemade Under the Sea Gumdrops be sure to link to this post and/or tag @HungryHappenings on Instagram and send me a picture so I can share it in my Readers’ Gallery. I am in love with your under the sea gumdrops. I’ve never made homemade gumdrops, but have so many molds that would work, I promise to give it a try! As much as you enjoy making homemade treats you definitely would love these homemade gumdrops. It’s so fun to make them using silicone molds in lots of cool shapes. LOL! I have always loved gumdrops. but these homemade ones are so much better than any I’ve ever tasted. I’d definitely give them a try!